I am SO excited to to be a part of the Special Education Summer Blog Hop hosted by Kinder SPED Adventures!! This week is all about SCHEDULING! I have a serious love/hate relationship with scheduling. I LOVE the puzzle that it is and trying to get everything to fit in (which is crazy hard when you have up to 6 grade levels!). But man oh man do I HATE how many times I have to change my schedule in the first two months of school. It always changes when Speech, Occupational Therapy, and Physical Therapy comes in with their schedules. And then something that looked great on paper, is a disaster in real time. After 5 years, I feel like I have scheduling down to a science! Alright, so this might look MEGA confusing at first glance, but I promise it all has a rhyme & reason! Our schedule can get very crazy and I have to map out each day of the week. Our school runs on 40 minute blocks, so that is how I have to set up my day. My classroom is a K-5 classroom (last year I had every grade except for 5th) and all of my students go with their regular education classroom to their "encore" (that's what my school calls Music, Art, & PE). Typically, these students are in their encore with a paraprofessional for any supports they may need. 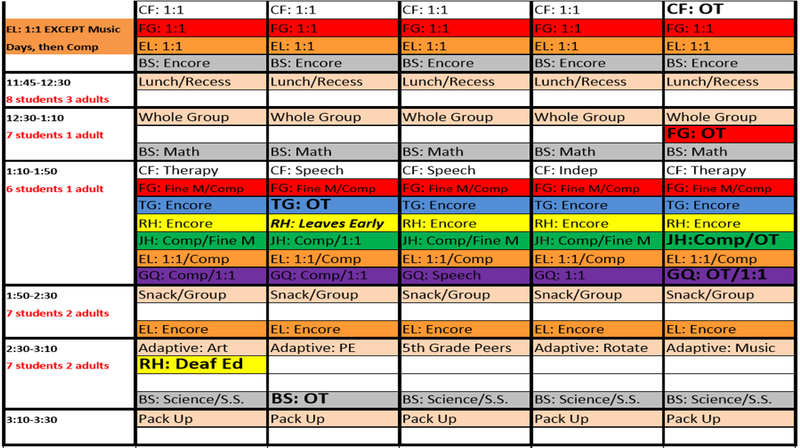 We also have an adapted encore as a class, which is used as my planning period! I like to color coordinate this schedule per student. Each student has their own color (plus I use initials as well!). 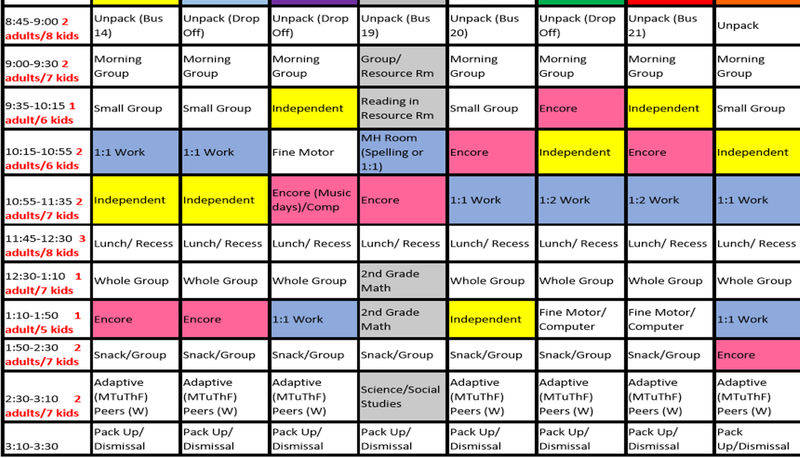 Each student is allotted 40 minutes each day to work on their individual IEP goals, which I list as 1:1 on the schedule. Students also rotate to independent work bins, fine motor work, whole group, small group, etc. I will get into this more when we talk about classroom set-up! 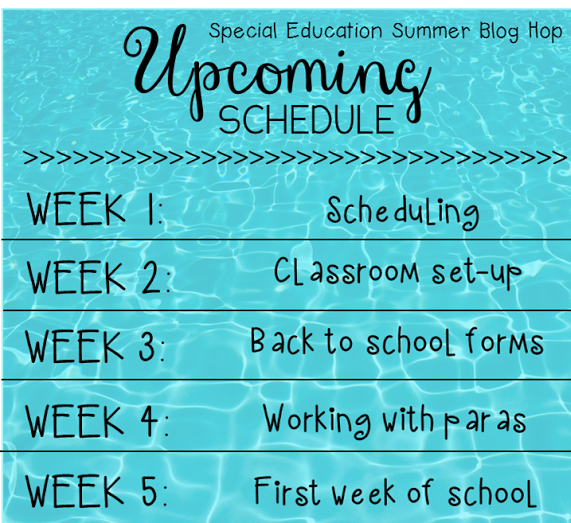 As we know as special educators, the schedule doesn't ALWAYS go as planned (shocker right?! hehe). If a student isn't able to sit and work for 40 minutes, I modify it for them. They might need to take a sensory break 10 minutes in, or work for something such as books or computer. The one thing I ALWAYS incorporate into my schedule is morning group and a whole group. When I started teaching in my district, many of these students were never expected to sit at a desk for a whole group activity. This is SO important, plus it's a great time for me to work on the extended standards with everyone! We use Unique Learning Systems during our whole group time most days, or even do fun activities such as a theme craft, bingo, etc.! 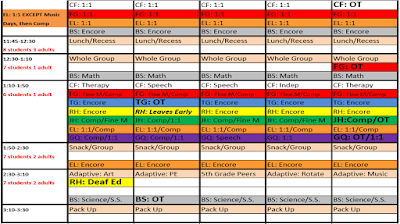 Here is a more "basic" schedule for me to look at a quick glance, a little less confusing! Again, each student's name is at the top (with their color that is used on my other classroom schedule), and is a lot easier to read. 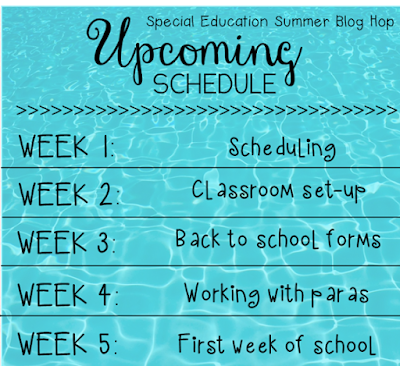 It doesn't include related services or possible changes because of a certain day of the week, rather is a general overview of each student's day. Obviously, each year holds a new schedule. 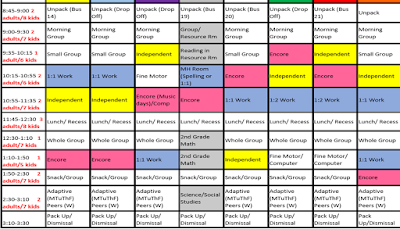 Some years we can do centers, small group, or multiple whole groups. Some years, we have to stick to a lot of individual work or 1 adult working with 2 students! Depending on my student's abilities, grade levels, and our staff ratio, it's always an exciting puzzle for me to figure out come August! 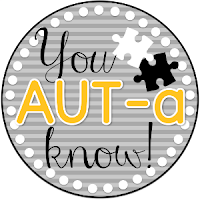 Check out Erin's post ALL about scheduling over at You AUT-a Know! Look at that color coding!! Impressive!! 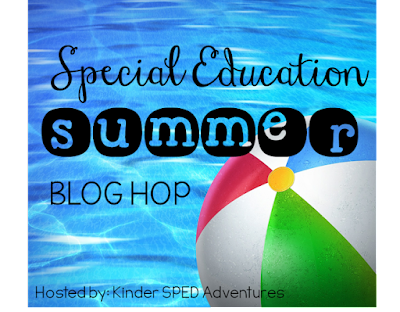 I enjoy seeing schedules of special ed teachers that are self contained, sometimes it makes me wish I had a self contained group, but I do love going to the regular ed class to work with my kids and their teachers. Love the colour-coding! I think I am going to have to do that with my schedules! 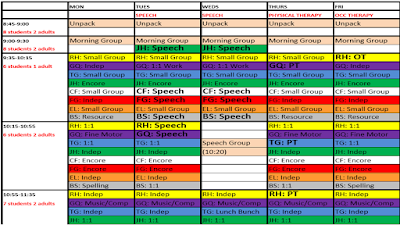 Color coding- I love to color code my schedules. This is a great post!